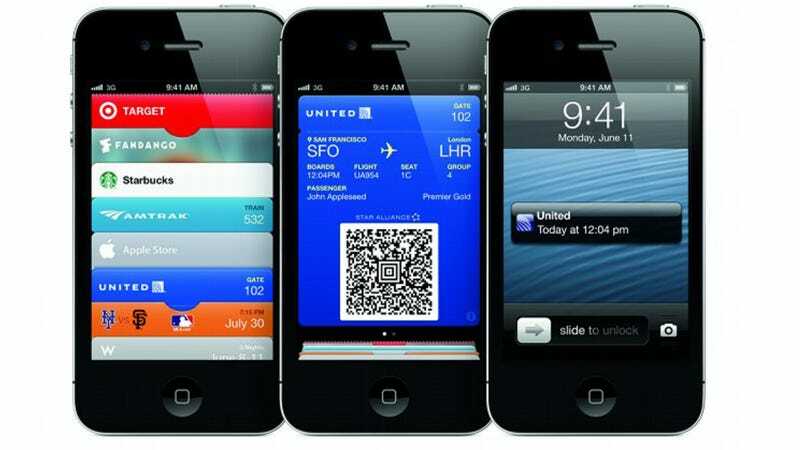 Passbook is a new mobile wallet from Apple that will debut in iOS. Right now it's not about payments, it's about ticket aggregation, but it's a sign of things to come. Currently, it allows you to combine your tickets and loyalty cards into one convenient place. It's intuitive, and pretty spectacular. Example 1: You buy movie tickets online. You show up at the theatre. Rather than fumble around for your pass, your phone's GPS senses that you've arrived, and your electronic ticket pops up on your phone automatically, ready to be scanned. Example 2: You're going to the airport. You've checked in already via your phone. Passbook is scanned as you go through security. Oh no, your gate has been changed. Passbook will let you know of the change instantly, in real time, from within the app. Very nice. You can use it to pay for stuff, like with your Starbucks card, but this is just the beginning. It currently uses QR-codes (seriously!?) for a lot of the scanning, but we think this is a good indicator that NFC will be coming to the next iPhone. We shall see. Apple will be releasing the API so developers can utilize this, which is, of course, critical for it to take off. Just judging by our first glimpse, it looks pretty excellent. Images via GDGT and Wired.